Update: EA will be adding one new Ultimate Legend each day from now (Mon, Feb 11) until Thursday, but the solos for these players won't be out until Saturday (Feb 16). Saturday is also when EA will start the "regular cadence" for Ultimate Legends, releasing 3 new ULs each Saturday morning. You can get these Ultimate Legends in packs or by completing their Sets. Each Ultimate Legend has a Career Edition (listed above), 2x Season Editions, and 3x Skill Editions. The Sets for each Ultimate Legend require all 5x non-Career Edition versions to complete. Check out all of the Ultimate Legend versions in the Muthead Database. You can also trade in 16x Ultimate Legend Tokens to receive a random 97+ OVR Ultimate Legend. There are 12x Solo Challenges broken up into 4 Sequences. Completing each sequence rewards you with the Power Up version of two of the Ultimate Legends, a random 87+ OVR Skill Edition Ultimate Legend, and an Ultimate Legend Token. These Sets will refresh each week. What do you think of the first batch of Ultimate Legends in MUT 19? Don't waist your money on the single packs! They only give you 87's and 90's, it's a waist of coins and money! If you want a full Ultimed Lengend your going to have to spend some moolah! Your going to have to buy a bundle. Believe me when I say your chances of pulling one in the single packs are 10% out of 100% with 90% of your coins and money gone! But it's up to you. Having said that I would really like a rick waters for my 9ers team theme please. Got 2 88s, a 90, and a 87 after doing the solos. Sold the powerups and traded the ULs for training. Pretty good so far, but we need to wait a month for 1 97? Mf Calvin 94 just turned into training. Hopefully I can add mean joe greens 94 whenever they release his ul. I like having the gem stone. I like it! 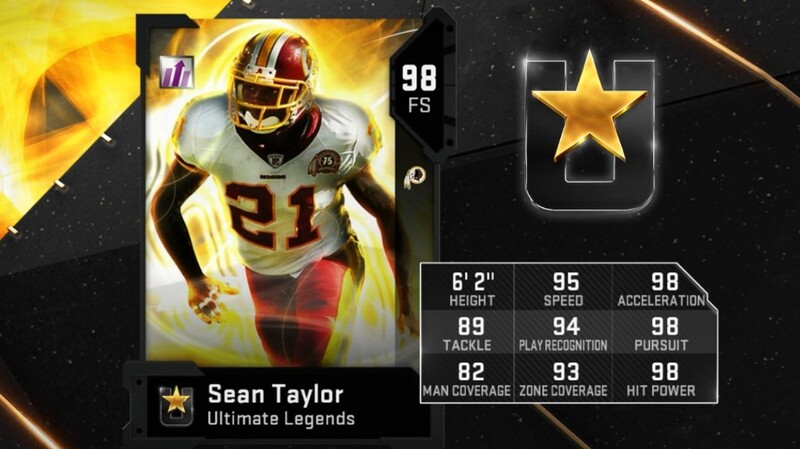 Can't wait to get that sean taylor card in the lineup. Still waiting on an updated JPP card. Dude has had a great career and 12.5 sacks this year. Think it makes sense that he'd have a start-worthy card for giants/bucs. Can we make it happen? Good job by EA this time imho. That.... that.. card art looks like the best Madden has ever had. Wish I would’ve sold my 93 tucker lol. Nice to see them add power ups for punters and kickers. They need to do this for all teams to help with theme team chems. Should’ve released and Adam Vinatari power up and legend. Already released legends should only be given training point upgrade slots and not new cards. If they were limited releases then give them power ups. I wanted to see 7 new players released. We got 1 today, the Bill Romanowski. One is better than none, but come on EA. Nice that they released new solos though. Well all the cards that had a quick sell of 500k will most likely become an ultimate legend. The legends that came out first or at least all the low level upgraded ones will be re released as ultimate legends. Then the high overall legends will be the last to come out due to them being a high overall when upgraded. EA logic. Looks like I'm back to working the AH for coins. Gotta upgrade my Taylor and Kearse.